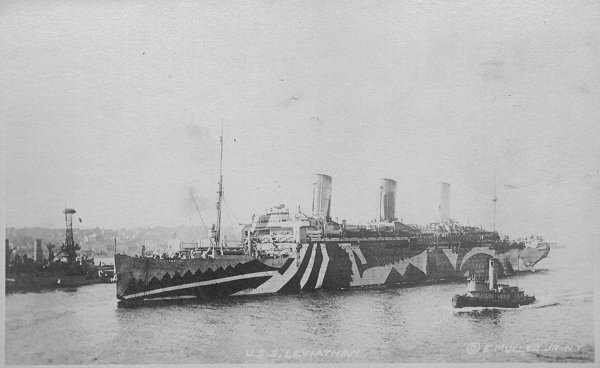 USS Leviathan, a 58,000 ton (displacement) troop transport, was completed at Hamburg, Germany, in 1914 as the German flag passenger liner Vaterland. 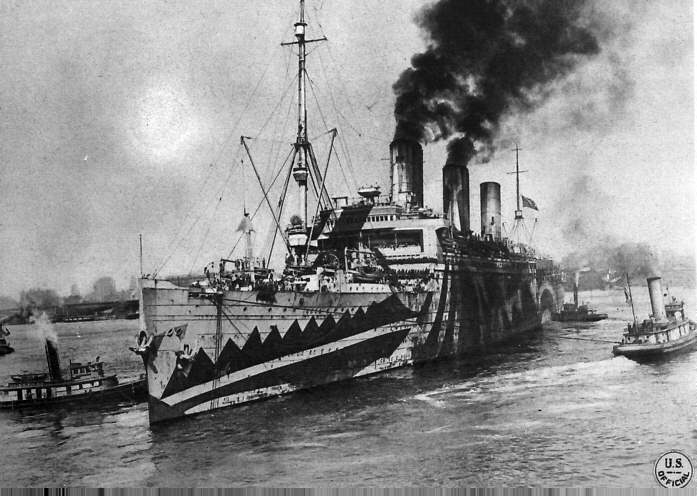 Laid up at Hoboken, New Jersey, when World War I began, she was seized when the United States joined the conflict in April 1917. 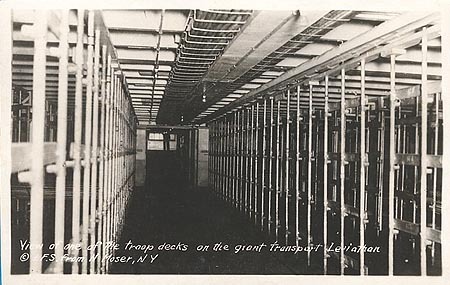 The Navy took custody of the ship soon afterwards, placing her in commission as USS Vaterland in late July 1917, while she was being refitted for service as a troop transport. 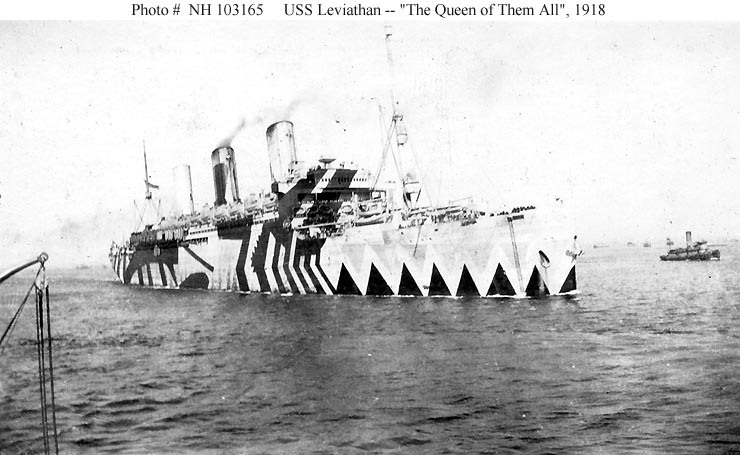 In early September the ship was renamed Leviathan, and appropriate name considering that she was then the largest ship in the U.S. Navy, and in the World. The Navy would not operate a bigger ship until 1945, when the slightly longer and heavier aircraft carrier Midway entered service. 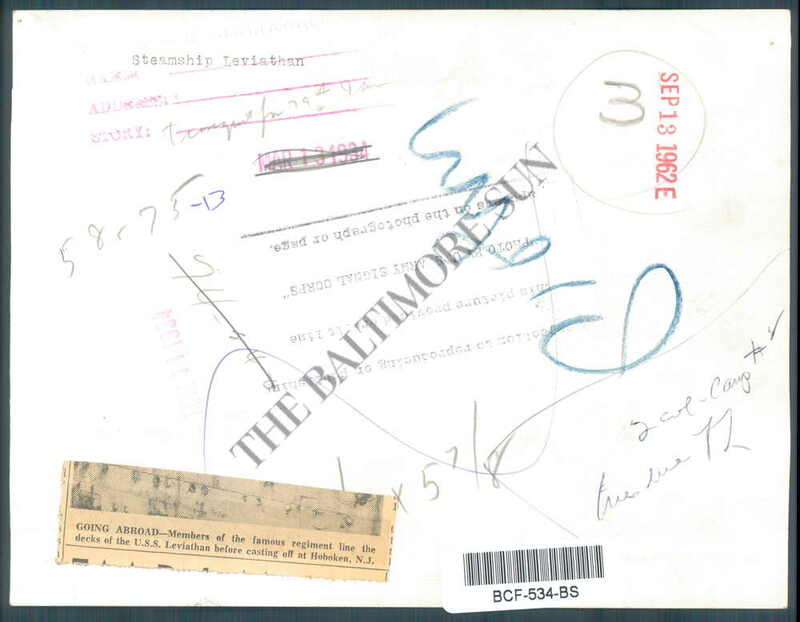 Leviathan's seagoing Naval career commenced in November 1917, when she made a trial trip from Hoboken to Cuba and back. 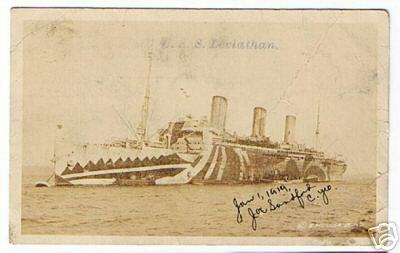 In December she took troops to Liverpool, England, but repairs delayed her return to the U.S. until mid-February 1918. A second trip to Liverpool in March was followed by more repairs. 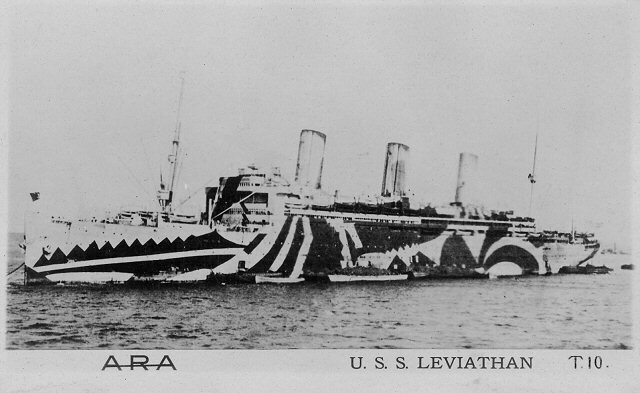 At that time she was repainted with the British-type "dazzle" camouflage scheme that she carried for the rest of the war. 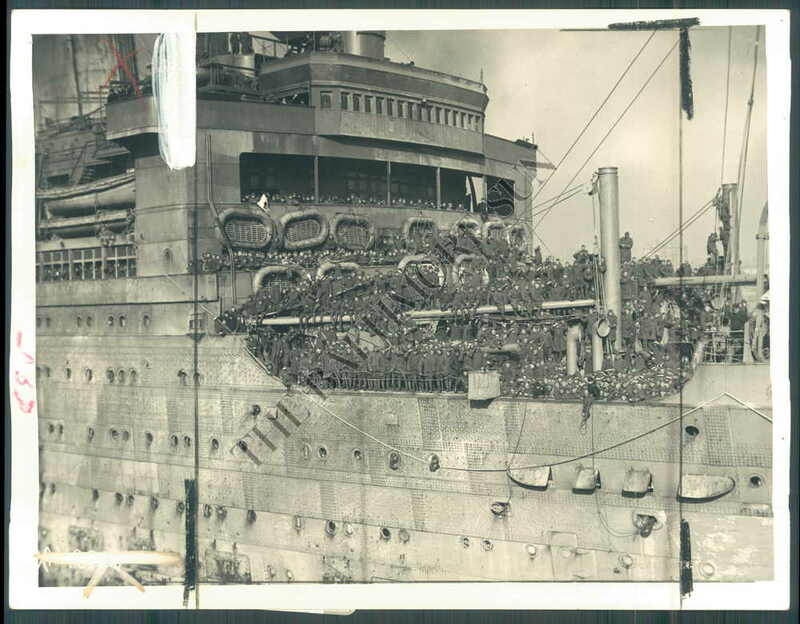 With the completion of that work, Leviathan began regular passages between the U.S. and Brest, France, delivering up to 14,000 persons on each trip. In all, she transported nearly 120,000 servicemen to the combat zone before the November 1918 Armistice brought the fighting to an end. 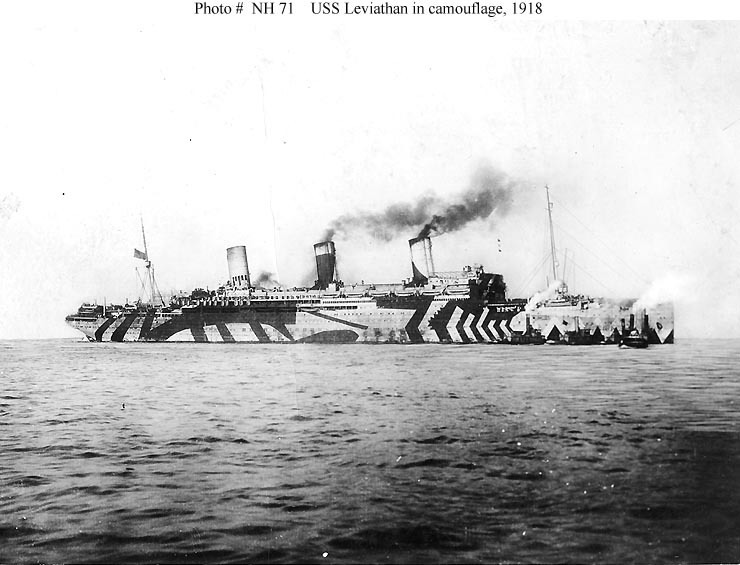 Shortly afterwards Leviathan, repainted grey overall by December 1918, started to bring American war veterans home. She made nine round-trip voyages for this purpose, completing the last in September 1919. 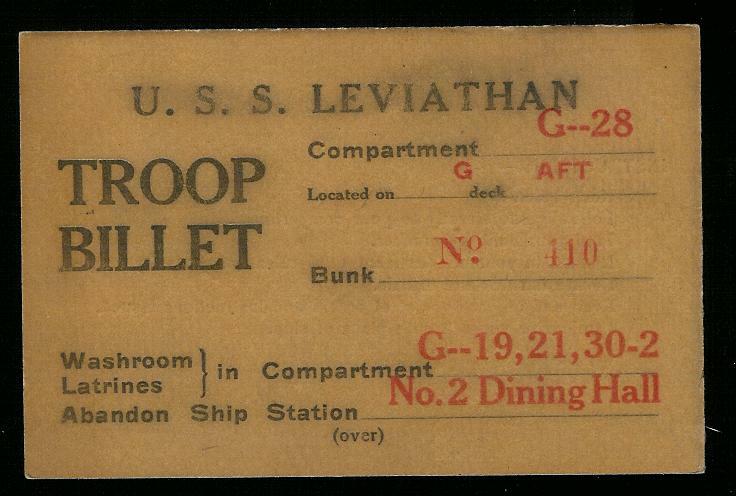 Late in October, USS Leviathan was decommissioned and turned over to the U.S. Shipping Board. She later became the U.S. Flag ocean liner Leviathan. The great ship was scrapped in 1938. 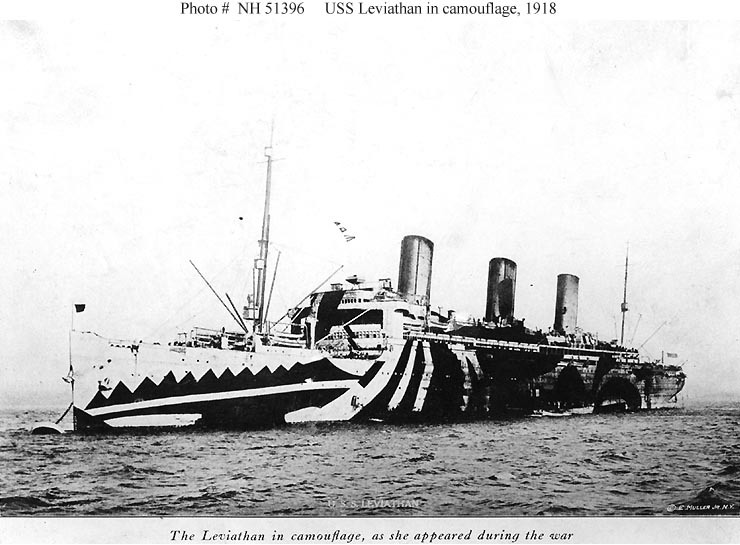 The Leviathan was equipped with eight six-inch naval guns, and had a picked crew of American Naval gunners to man them. each man standing watch in turns of four hours and keeping close watch over an angle of twenty degrees. 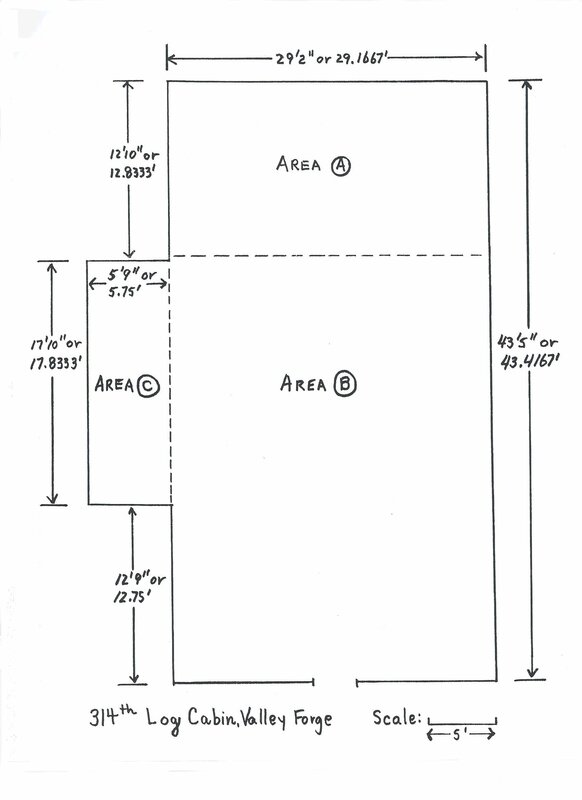 Each observer was instructed to watch only his own specified space - the angle for which he was responsible. Thus every inch of the ocean was under close observation. 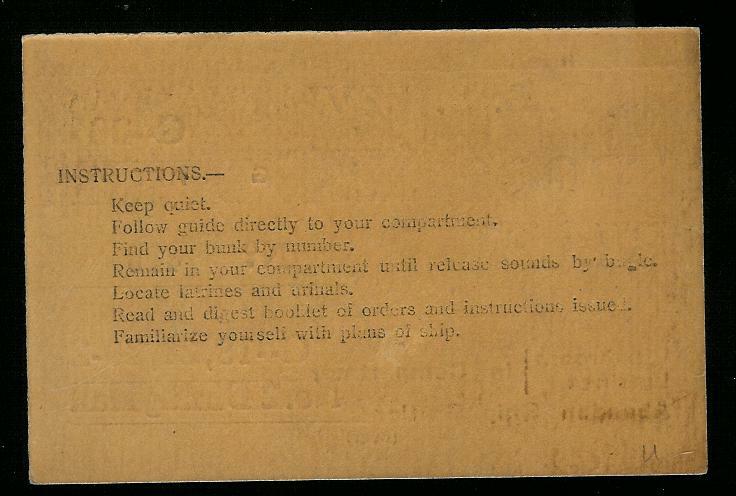 From "A Machine Gunner's Notes - France 1918", pages 47 and 48.